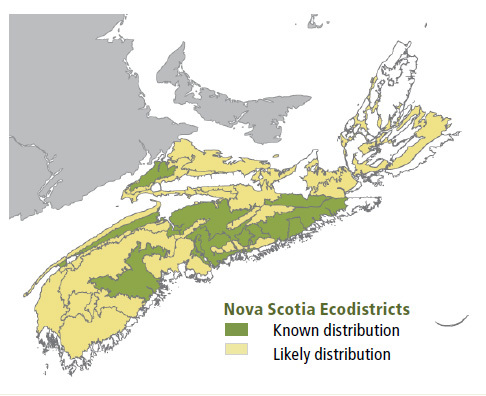 Concept: This early to mid-successional ecosystem is the most nutrient-limited floodplain forest classified in Nova Scotia. The low elevation deciduous forest is characterized by red maple canopy dominance and by a moderately broad group of herbaceous species. Typical understory plants include a mix of floodplain and wetland species. Vegetation: Canopy layers are usually closed but some stands feature more widely-spaced trees. Red maple is the only dominant canopy species, but trace amounts of yellow birch, ironwood, white ash and several conifers may be scattered throughout. The woody understory is usually open with scattered individuals or pockets of wild raisin, beaked hazelnut and regenerating trees. Herbaceous cover is moderate to high depending on available moisture. Dwarf raspberry, sensitive fern, rough goldenrod and bladder sedge are common species. Some occurrences of FP3 support high levels of short husk. Ground bryophyte and lichen cover is absent or reduced. Environmental Setting: FP3 is mainly associated with fresh to moist, nutrient rich alluvium soils. This Vegetation Type (VT) can be found on active floodplains, low riparian slopes and on inactive terraces. Active sites typically flood annually. Most FP3 sites occur in the middle reaches of rivers found across the province. Rooting zone texture is variable, but sandy loams are most common. 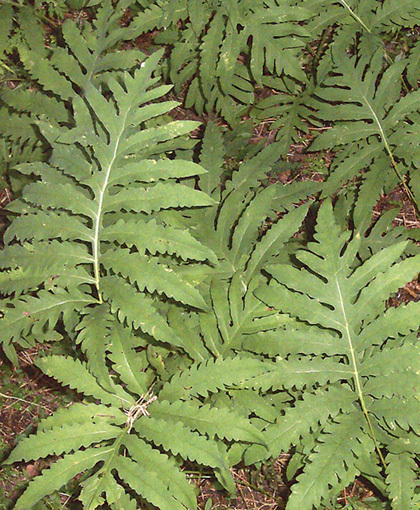 FP3 (Red maple / Sensitive fern – Rough goldenrod) occurs across southeastern New Brunswick, but only small, disturbed fragments remain on Prince Edward Island. Successional Dynamics: FP3 is an early to mid-successional VT. Moister occurrences are expected to persist as an edaphic climax, while stands on better drained sites may succeed to FP1 (Sugar maple – White ash / Ostrich fern – Wood goldenrod). 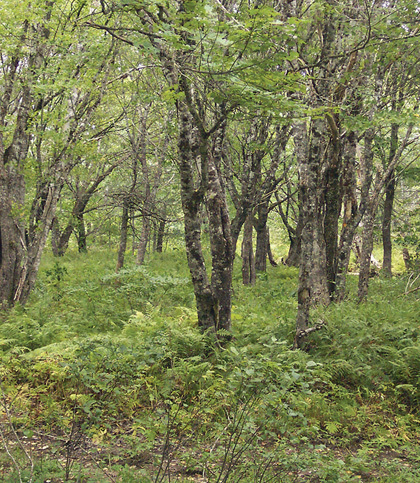 Stands on inactive floodplains or glaciofluvial soils may succeed to an upland forest type. Successional development will depend on available seed sources, site conditions, disturbance regime and geographic location. Disturbance agents include flood events, ice scour, insects and disease, farming and harvesting. Ecological Features: The Red maple / Sensitive fern – Rough goldenrod is usually on more nutrient-limited floodplains, with lower species richness and reduced productivity, but some stands occur on better sites with increased biodiversity potential. This small patch ecosystem typically supports fewer rare plants than other floodplain forests, with some notable exceptions (e.g. hooked agrimony, Canada wood-nettle and black ash). It is the only forest ecosystem from which the extremely rare false nettle has been documented. The VT supports habitat for numerous riparian vertebrates, while red maple (that flowers before spring leaf out) provides one of the most important early and reliable pollen sources. Similar to other riparian forests, it promotes landscape connectivity, water quality, stream bank stability and channel integrity. Old growth potential is low, except where FP3 forms an edaphic climax on moist sites; in which case a unique form of old growth may develop. Distinguishing Features: This floodplain vegetation type can be a complex of well to poorly drained sites usually with well-defined seasonally active channels and depressions. Red maple is the dominant overstory species. Sensitive fern, bladder sedge, meadow rue and dwarf raspberry are typically present. Cinnamon fern is scattered but a good indicator.